Validated Access Scheme (VAS) Category 4: Accessible to all wheelchair users including those requiring assistance to transfer to and from the wheelchair e.g. carer/partner. Ground floor bedroom with emergency alarm button. 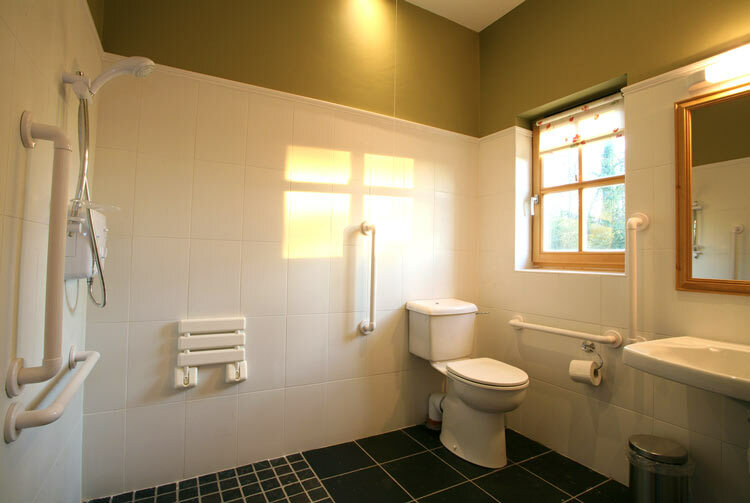 Large accessible Wet Room. Washbasin fitted with lever taps and clear under space. Shower controls at correct height, fixed shower seat and grab rails, separate shower chair. Emergency cord. Kitchen. Suitable work surfaces and clear under spaces including sink and hob, electric sockets, light, heating and cooking controls accessible from a seated position. Fridge and oven at recommended height with side hung doors. If you have any specific needs please contact Ena Collins to ensure these needs can be accommodated. Mission: “The Welcome Lodge would like all our guests to enjoy a unique relaxing holiday in a tranquil rural setting and are committed to providing an accessible environment for all“.